The arrival of winter to Flaming Gorge does not mean the fun is over. In fact, a visit to this beautiful and diverse area during the colder months of the year may be enhanced by the long shadows, the snow-covered mountains, and the solitude found surrounding the 91-mile reservoir. 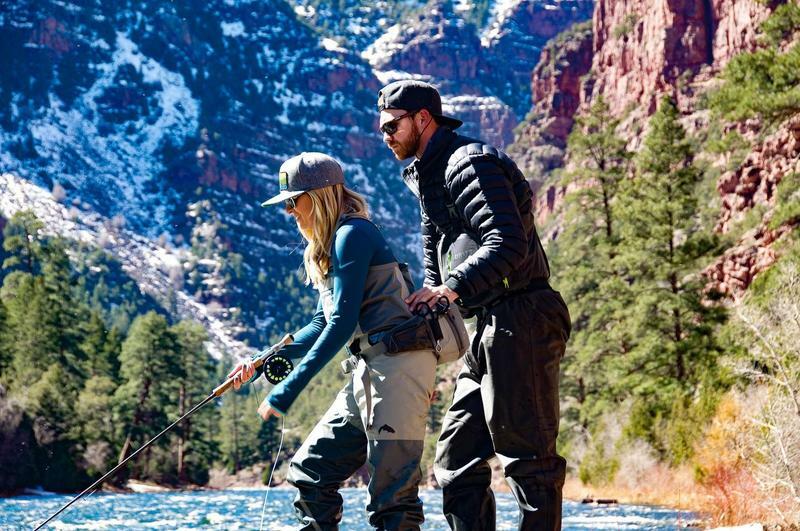 In addition to enjoying the world-class fishing on the lake and the Green River below the dam, people travel to Flaming Gorge to snowmobile, Nordic ski, view wildlife, absorb the magical landscape, and recharge at the local lodges. Come experience winter at Flaming Gorge for yourself. Winter days are short and the nights are long so be sure to book your stay in Flaming Gorge at one the area’s comfortable lodges. The centrally located Red Canyon Lodge is highly recommended, offering private cabins, a full-service restaurant that serves lunch and dinner, and miles of groomed trails perfect for hiking, snowshoeing, and cross-country skiing. While there, you’ll have the chance to experience towering forests of ponderosa pines, mountain lakes, dramatic views of Flaming Gorge Reservoir. You also have a good shot of spotting bighorn sheep, deer, and moose. 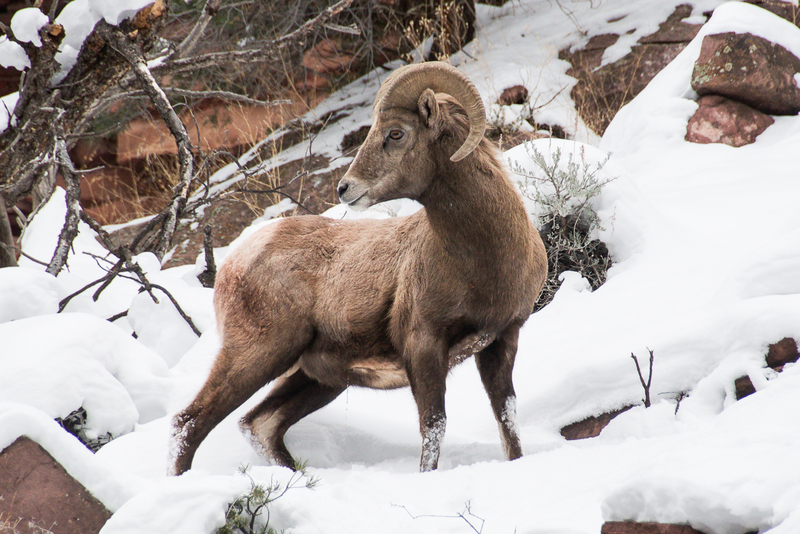 One of the best ways to experience Flaming Gorge during winter is by exploring its scenic byways. By slowly traveling these routes you can visit dramatic overlooks, witness the impressive geologic landscapes, and see wildlife. The Uintas National Scenic Byway is more than 200-miles long, running between Vernal, Utah, and Rock Springs, Wyoming. You can take multiple days exploring the route, which includes the Flaming Gorge Dam & Visitor Center, Red Canyon Overlook & Visitor Center, the Green River, Expedition Island, and Firehole Canyon. The Sheep Creek Geological Loop is 13 miles and includes opportunities to see bighorn sheep and visit Dowd’s Gravesite, with numerous scenic pullouts along the way. A trip can take anywhere from a few hours to all day. The Jones Hole Scenic Backway leads into Dinosaur National Monument and provides a beautiful setting in which to visit the hatchery, hike, and fish. A trip out to Jones Hole is a perfect winter day for the entire family. Cross-country skiing and snowshoeing are fast growing activities in the Flaming Gorge National Recreation Area and with miles of groomed trail you’re sure to find something suitable for all fitness levels. Local favorite Canyon Rim Trail begins at the Red Canyon Visitor Center. From there the trail takes you along many overlooks where you can see the land drop dramatically 1,400 feet below to the blue waters of the reservoir. With very little vertical change this trail is a good one for the family. Check with the visitor’s center for information on the latest wildlife sightings. Miles of groomed and ungroomed snowmobile routes weave their way from forests of pine and stands of aspen to open meadows where riders are treated to stunning views of the high Uinta peaks. The Elk Park/Don Hatch Memorial Trail is a must-do for all snowmobile enthusiasts visiting the area. This trail system contains section of giant ponderosa pines, vistas of alpine summits, and views of the reservoir beneath the Red Canyon Overlook. 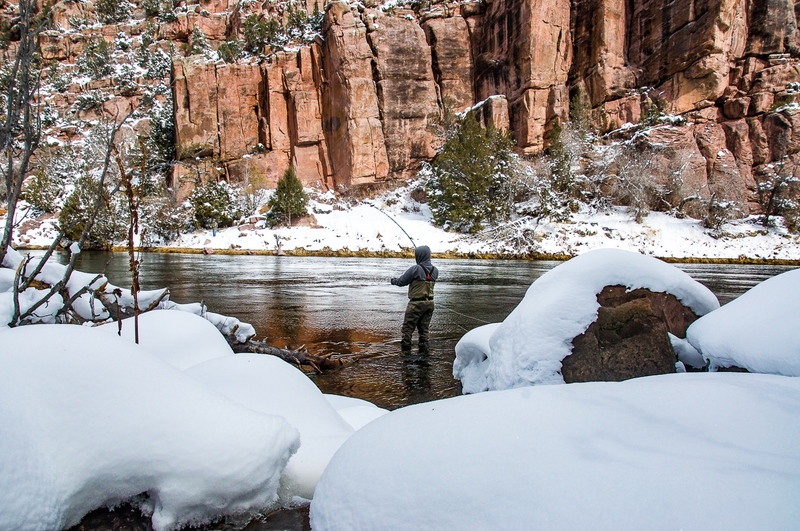 The Green River below the Flaming Gorge Dam is a blue-ribbon fishery that doesn’t sleep during the winter months. For the cooler days on the river, streamers are very productive and on sunny, mild days midges and Blue Wing Olives offer plenty of action for dry-fly anglers. Winter on the Green offers solitude where it can just be you and the osprey soaring high above. Fishing on the reservoir is a year-round activity too. On the southern end where the water stays ice-free, rainbow trout are still caught in the colder months. But it’s fishing through the ice further north that has everyone excited. In recent years, burbot was introduced illegally to the reservoir and has seen its population explode. This invasive fish has been wreaking havoc on the all the other game fish in the reservoir. To combat this, the communities along with government agencies have been promoting the harvest of burbot. And luckily for you burbot is easy and fun to catch with the bonus of being delicious. Per the Utah Division of Wildlife Resources: “You will find the best activity at night while using glow-in-the-dark lures like Yamamoto grubs, Radical Glow tubes, Maniac Cutterbugs and Northland Buckshot spoons. Tip the lure with sucker/chub meat, recharge the glow frequently and jig the presentation close to the bottom.” The annual Burbot Bash, a three-day ice fishing derby based out of Manila, Utah, features an expo, prize drawings, a fishing tournament (with cash rewards), and a delicious fish-fry. Enjoy yourself while helping preserve the world-renowned Flaming Gorge fishery. This winter the Burbot Bash will be held January 20-22. Whether you come for the scenery, the fishing, or snowy activities, a visit to the Flaming Gorge area during the winter months can be the breath of fresh air you need. 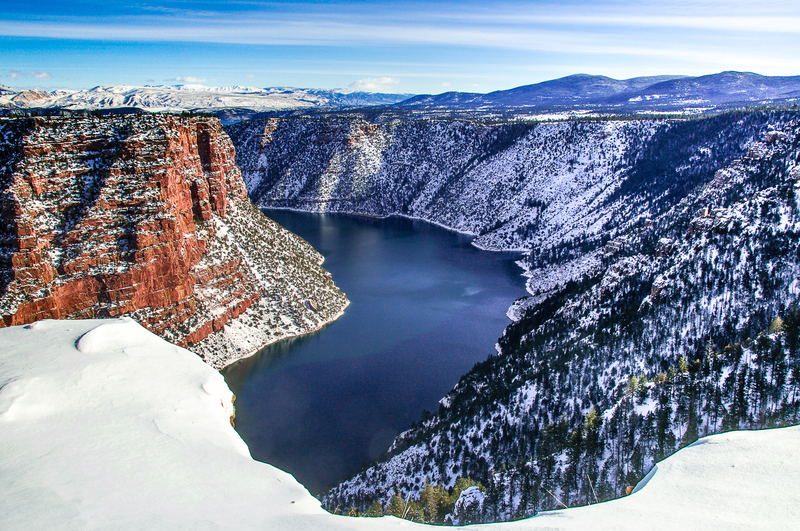 As the author and playwright Anton Chekhov once said, “People don’t notice whether it’s winter or summer when they are happy.” So pack your warm clothes and make your way to the wonderland that is Flaming Gorge. Thank you for visiting http://www.flaminggorgecountry.com/5-winter-activities! Be sure and revisit flaminggorgecountry.com frequently for content updates and more.